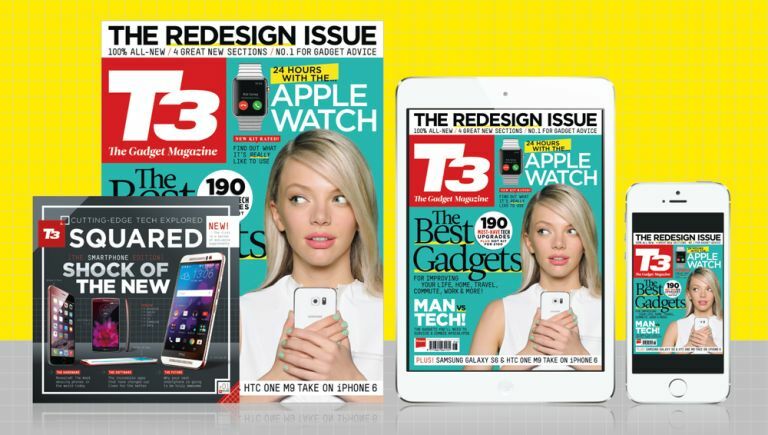 T3 is the world's leading and longest running tech mag, and now it's had a new lick of paint. Literally everything short of the editor's desk has been reconfigured, repointed and revamped, for your reading pleasure. Because we firmly believe that Life's Better With T3. Very firmly. The new mag is physically larger, features spanking new sections from Elite (the best of the best tech this month) to Man vs Tech (this month: we send a journalist into the woods armed only with a car full of gadgets and hope he can survive a zombie apocalypse - good luck, mate) to the sage advice of Gadget Guru, a man who knows more about tech than is strictly healthy, and is here to answer YOUR questions. There's also fully recharged and expanded reviews and buyer's guide sections. As if that were not enough, T3 also now comes with T3 Squared, a 16-page bonus mag that devotes itself to one key topic per month. This month, T3's resident mobile phones pointy-head Gareth Beavis tells you all you need to know about smartphones: what to buy today, how to get the most out of what you've got, and what to look forward to in the future. Want a copy right now? T3 is available in all good newsagents, and probably some rubbish ones as well. You can also have at the iPad and iPhone edition here. Want a copy right now AND a fantastic tech prize? Track down one of our editors, who are currently sunning themselves in various famous locations around tropical, sun-drenched Britain, armed with prizes, free copies of the mag and, hopefully, a large Thermos of soup. See how cheery AV expert Marc Chacksfield looks here? (He's already given away his prizes, so you're out of luck, London). Prepared to wait slightly longer? T3 subscriptions can be ordered right here.